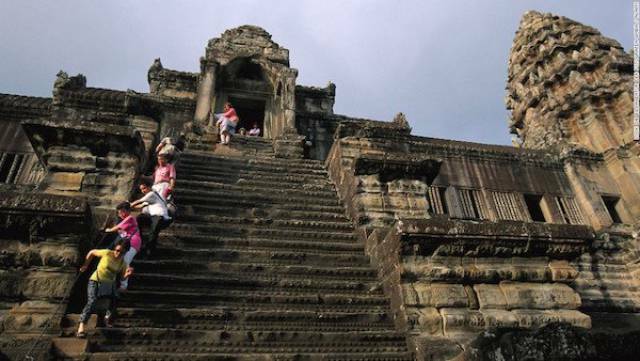 The steps at these temples are inclined at a 70 degree angle, and were meant to remind the monks that the route to heaven was difficult. 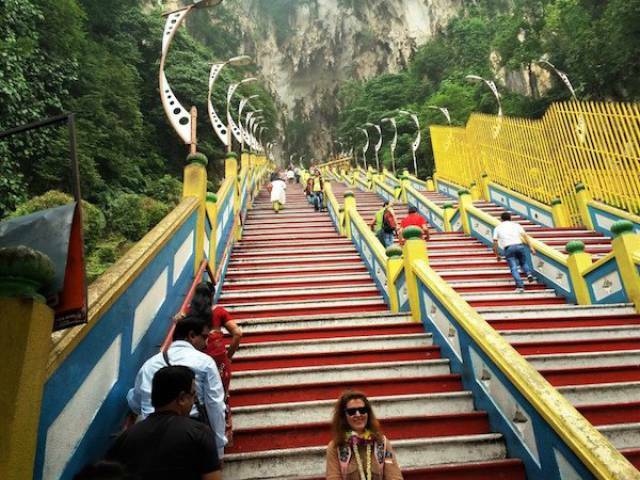 Tourists have the option to use rope rails and specially constructed ‘easy’ stairs, but the truly dedicated try make it up and down these original steps at least once. 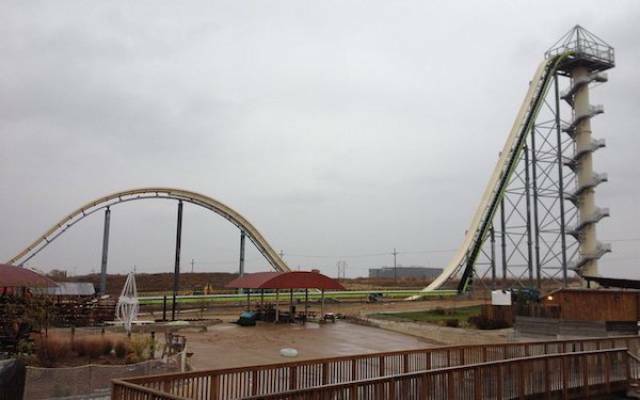 It takes a lot of stones to climb the 264 steps to get to the top of this waterslide at the Schlitterbahn Waterparks and Resorts. Once you’re there, 168 feet/17 stories above the ground, it’s time to take the plunge. If you’ve successfully managed all those stairs, there’s a 50-foot linear drop, at 65 mph waiting for you. To get to the top of the most iconic peak in the park, you need to take a seven-mile (one way) all-incline hike through a wilderness that takes you up a rock face. You’ll need to rely on a cable ladder for 400 vertical feet. You’d definitely need to make sure you have the right footwear and the weather is just right. If it’s too wet, or you don’t have the right kind of grip, it’s a long way down. But the view is worth it. 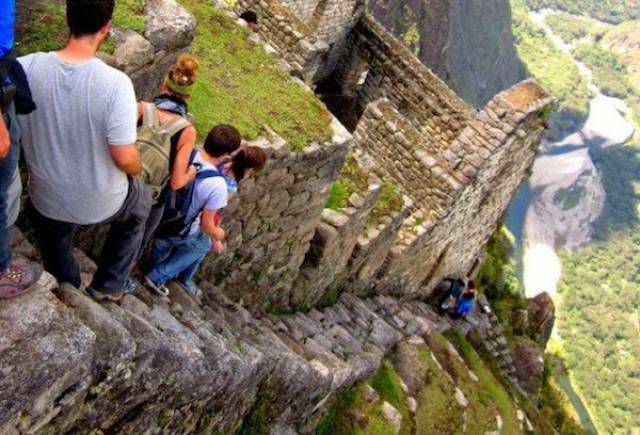 At Machu Picchu, there’s 600 feet of steep, slippery and cloud covered granite rocks, that were carved by the Inca over 500 years ago. The climb is limited to only 400 people per day and there’s chains in some of the worst parts, but the majority of the climb is a sheer, damp wall on one side and a straight drop into the Urubamba river on the other. If you want to see the view from the very top of this symbol of freedom, you need to check your fear of heights and claustrophobia at the door. The platform at the crown requires a cramped, 146-step double helix spiral staircase with 6 feet of head clearance. Real troupers will take the entire tight 377-step hike all the way up the lobby, which is the equivalent of a 20-story building. 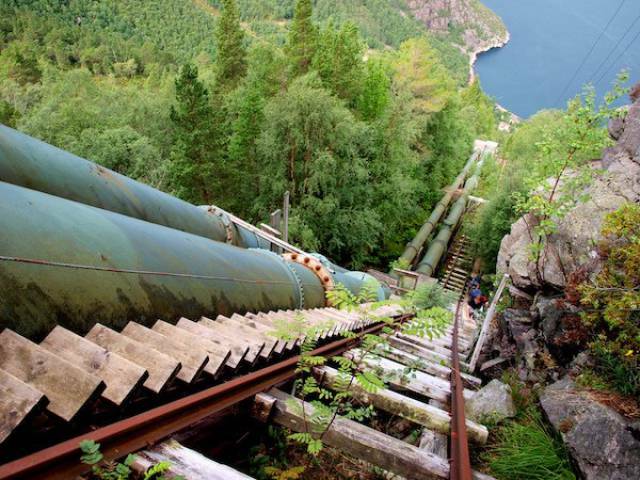 The power station in the town of Lysefjord is one of the best hikes in Norway, and these stairs are the reason why. 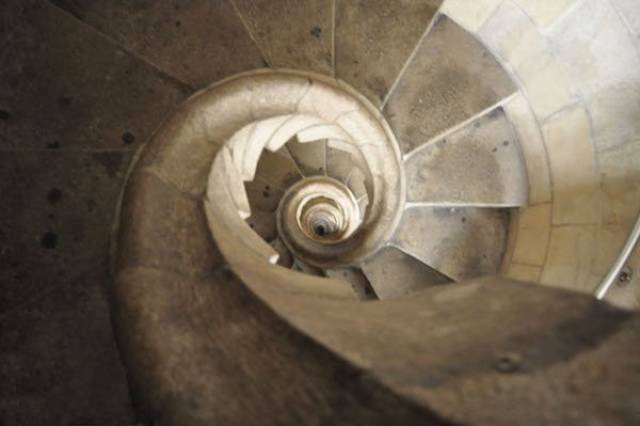 There are a total of 4,444 steps that ascend to a height of 2,427 feet from the bottom. This is the longest wooden staircase in the world, so it’d be wise to listen to every creak and crack as you’re going up. 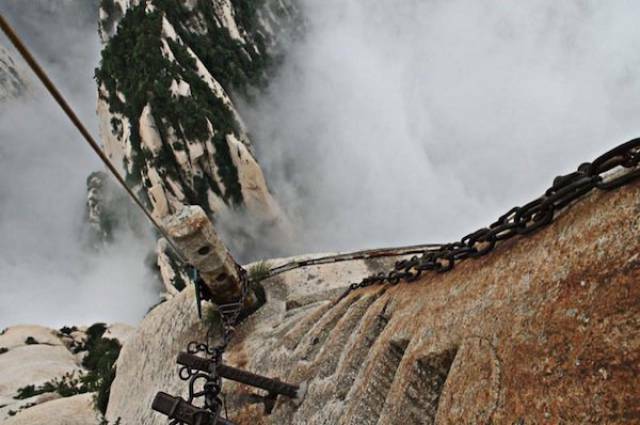 There’s no official count of the steps on the side of this sacred Taoist mountain, but perhaps it’s because people are too terrified to keep count. After you finish making your way up the stairs, then you’ve got a hellish, three-plank-wide walkway to traverse to get to one of the most remote teahouses in the world. There’s not a lot steps here, they’re not too cramped and you get a series of handholds, so what’s the big deal, right? What makes these stairs so dangerous is that they’re at the summit of the tallest mountain in the Alps, and they’re open to the elements – gale force winds, chilly temperatures and avalanches. 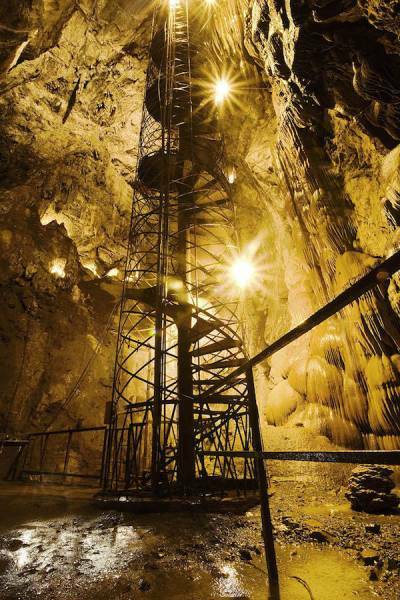 To get to the very bottom of the cavern, you’ve got to take a 100-foot tall curlicue staircase, welded over a century ago. At the bottom, you’ll find a cavern large enough to fit the Statue of Liberty. These stairs are so scary that it’s been banned to climb them. 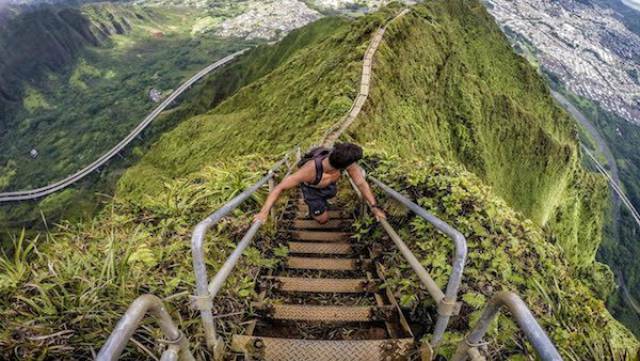 These 3,922 rickety stairs that go up to Oahu’s Koolau Mountain Range are so dangerous, that they’ve posted guards to prevent you from trying. 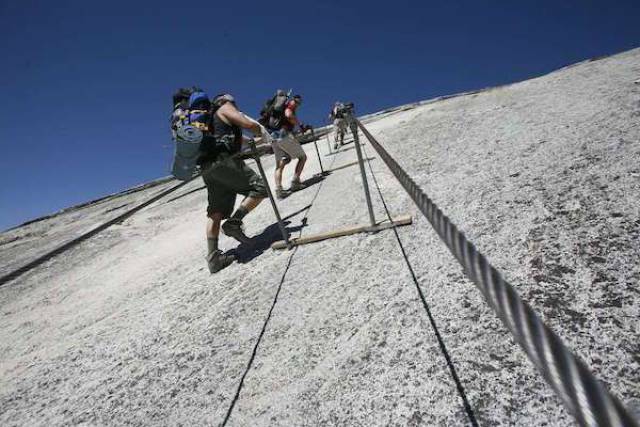 Built in 1942 by the US Navy to install communications wires, they were nicknamed the Highway to Heaven and were popular with hikers until 1987. It’s been more than a thousand years since this stairway was carved into the soft volcanic rock, 150 feet below the sandstone above. 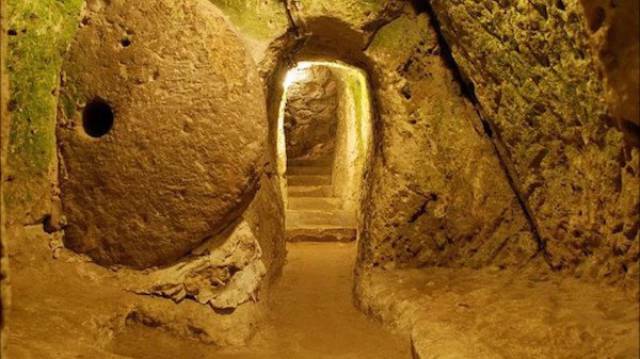 Experts aren’t sure of of the backstory of this underground complex, but they know it was inhabited by people until the 10th century, then abandoned until the 60’s. Having done these stairs, I can attest that they’re intense and insane. 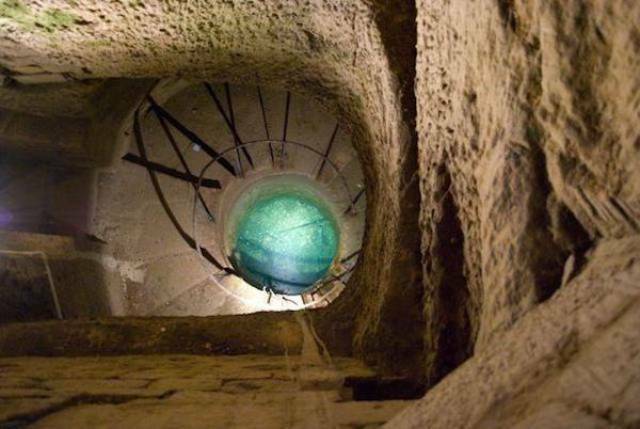 With over 463 stairs that twist and turn inside the walls of the Cathedral, it’s incredibly claustrophobic. All the stairs and passageways are worn and slick from the passage of centuries of pilgrims and tourists. But when you get to the top and take in the view, the near death experience is worth it. This is one of the most important Hindu holy sites outside of India, and there’s a series of cave shrines that are nestled inside a mountain. 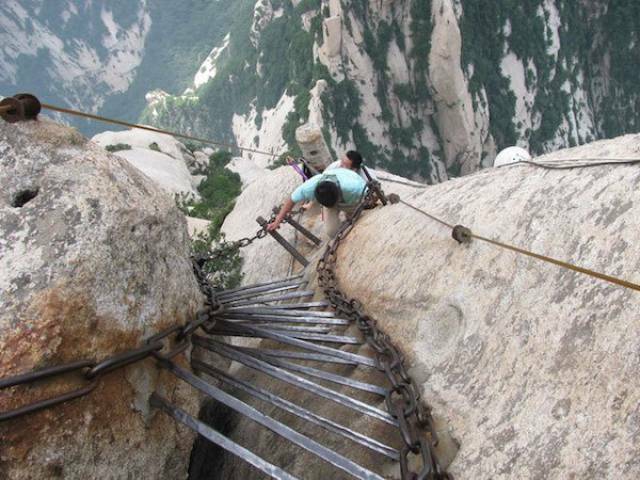 The only way to get to them is an ascent of 272 steps, 330 feet up the rock face. While the steep steps are nothing to blink at, there’s also sneaky macaque monkeys that’ll come after you to steal from your purse. Several people have gotten carried away swatting at the monkeys and tumbled down the stairs. Found at the end of M Street in Georgetown, this is one of the most frightening falls in film history. 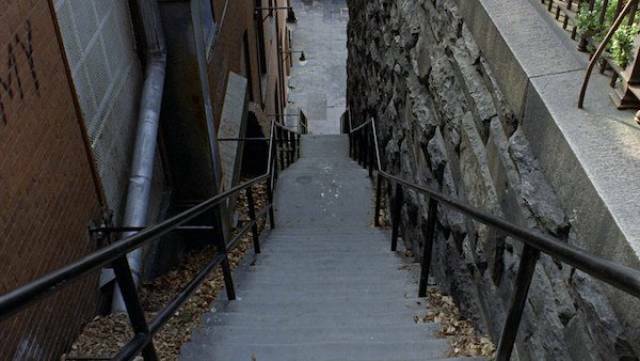 Made popular by The Exorcist, each of the 74.5 steps were padded for the stuntmen, but it doesn’t make the fall look any less lethal. 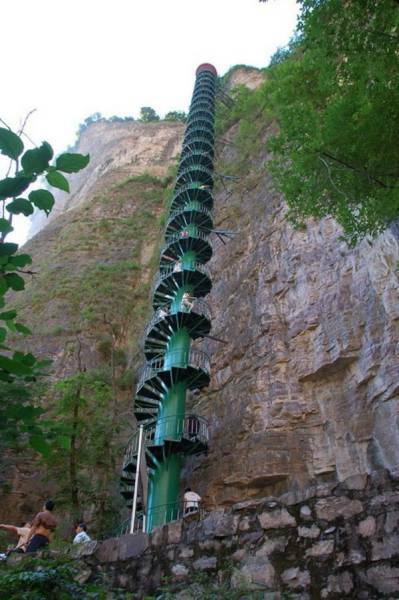 Outside of Beijing, in the remote town of Linzhou are these insane stairs. 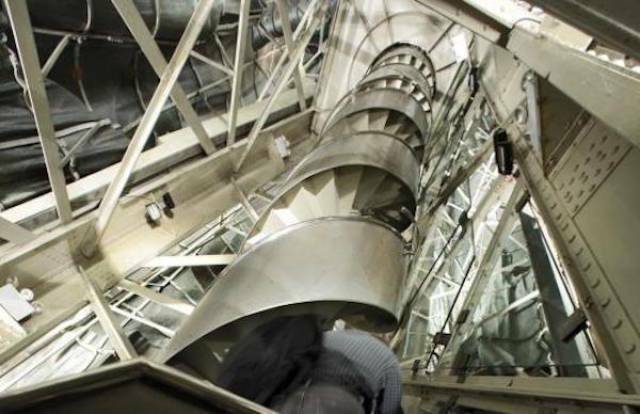 Hikers climb a 300-foot spiral staircase to get to the top. Before you do, however, you need to sign a waiver to say you’re in good health and not over the age of 60. It’s already creepy enough to wander through 1.2 miles of dusty catacombs that have the disturbed bones of the 6 million Parisians that had their remains transferred there in the 18th century. 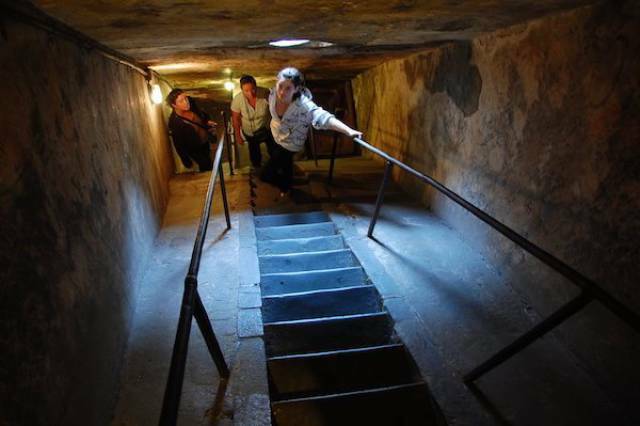 Even creepier are the various staircases that you’ll need to take to enter the catacombs, that’ll take you from the sunny beauty of Paris, to the dark depths of the ossuaries. This is a sight that everyone should try to see, but sadly, not a lot of people get the chance to. 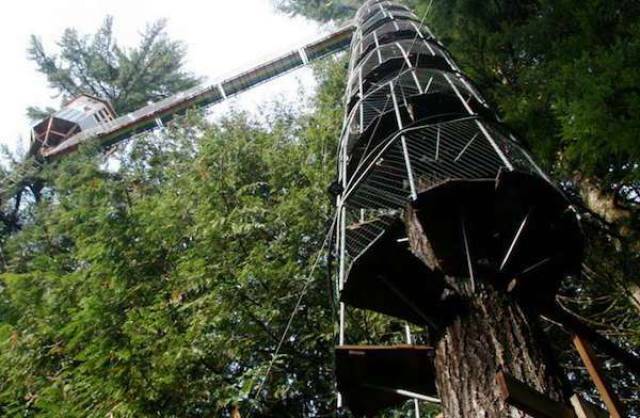 This tree house observatory has an unforgettable climb, that requires you taking an 82-foot spiral stairway. It’s one of the only cantilevered stairways on earth, built into a tree. There’s just a centuries old tree, some nuts and bolts between you and a free fall, but when you hit the top, it’s worth it. This church is a combination of traditional religious iconography and architecture as well as natural elements. For example, the columns and stair cases in the church are meant to look like trees and a forest canopy. These particular stairs are tightly coiled and there’s no banister to prevent you from falling down the middle edge, when you’re going up or down. 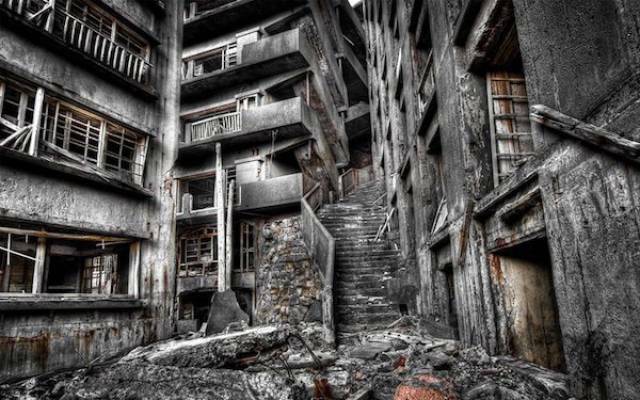 I’m sure everyone knows about this abandoned Japanese island of industrial ruin. While everything else has slowly decayed, these stairs are still holding strong. These were the stairs that connected the living areas to the mines for the mining community that lived here from the 50’s to the 70’s.